A decorative little cross pattern that creates a beautiful and discreet feeling in the room. The result is sweet and romantic as well as modern and graphical. Beata is a classical surface pattern that has existed for millennia, to which details like the sun and flowers have been added in order to create a variant that fits well with the greenery of Brunnsnäs. Our Svenska Flora(Swedish Flora) in colour is a magnificent volume that displays our country´s natural beauty and great variety of plants. 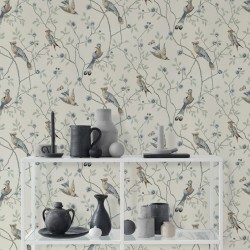 The Christophe wallpaper is reminiscent of a waving summer meadow. All the colours of the flowers are especially fresh thanks to the collagraph technique. Stripes are our starting point and pull the collection together. Evert is a classic two-colour stripe in soft shades. The pattern is strong and is intended for larger rooms.